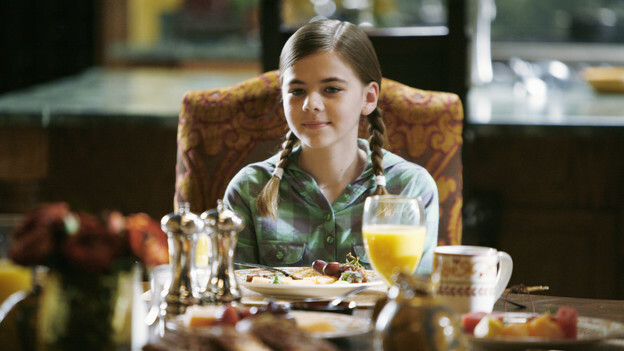 Blood Lines: The Gates S1 E10 "Little Girl Lost"
The Gates S1 E10 "Little Girl Lost"
I suspect if The Gates had included more episodes like "Little Girl Lost" the show might still be with us. Alas, most of the episodes were like "Identity Crisis," which is probably why it ended up on the scrap heap (you never know with networks). We start with Claire and Dylan as they come to the terrifying realization that they can't find Emily (or Christian) anywhere. They can't turn to their fellow vampires for help so they go to Nick. His first thought is to get the FBI involved but Claire and Dylan are convinced that Christian will kill Emily if he gets any hint of that sort of thing. So it's time for a secret investigation. While Dylan and Nick start tracking down leads, Claire is forced to stay behind in case Christian calls or returns. The menfolk follow one of Christian's aliases to a house where they find a dead couple and Emily's stuffed lion. The show gets high points for creepiness with this scene. As our heroes are trying to figure things out Christian calls Nick. At first he wants Nick to stay out of it, claiming that this is between himself, Claire, and Dylan (and that Emily is just collateral damage). But then he tells Nick to ask Claire and Dylan about St. Louis. It turns out Dylan and Claire adopted Emily in St. Louis after Claire killed her junkie parents before discovering the infant. They decided they wanted to make things right for the baby, as well as for themselves, and they tell Nick that Emily made them human again. Claire claims she accepts responsibility for her crimes and is ready to accept any course of action Nick deems appropriate--but he just has to help them find Emily first. The investigation back in full swing, it doesn't take them long to discover Christian's hideout. He's surprisingly easy to subdue but not quite forthcoming with information. When Dylan demands to know where Emily is, Christian claims that after what he's done with her they'll never get her back. As they continue to interrogate him, Christian turns things back on Dylan and Claire, telling stories of their evil deeds (making sure to mention that Claire has been out hunting with him recently) and asking Nick why he believes they're any better than he (Christian) is. When Claire insists they're nothing like Christian he suddenly declares he's willing to negotiate. He'll tell them where Emily is if they kill Nick. Right now. This is definitely an interesting scene. You can imagine Nick's fear as he's trapped with two loose and desperate vampires who see him as the only thing between them and what they want most. You can relate to the vampires as well--what human parent wouldn't do anything they could to get their beloved child back? And for a second there it looks as though Dylan's going to go through with it (some nice vampire action here) but then he regains control of himself. But he hesitated long enough to show Nick that Christian is right--no vampires are completely trustworthy--not even the ones who are supposedly your friends. The next bit is not quite as interesting. As Christian goes on about how the others are no better than he is and at least he acknowledges what he is, Nick suddenly clues in to where he took Emily. Because Christian keeps mentioning the suffering of his victims' families, Nick figures out that Christian took Emily back to her biological family. This was a little too quick and neat, as far as I'm concerned. It would have been nice if they'd spent a little more time searching for Emily. In any case, this revelation sets Claire and Dylan up for something of a custody battle. They find Emily happily visiting with her aunt and uncle and excited about learning about her biological mother. Aunt and Uncle always believed that junkie mom took off years ago with the baby; Claire and Dylan's story is that Emily was neglected and abandoned. Of course the biological family expects "Piper" to live with them from now on. But Claire and Dylan have adoption papers and the law on their side (it's interesting to note that Nick backs the vampires on this--insisting that human Emily go back home with them even though he knows what they're capable of). Of course, auntie isn't going to give up that easily and even though she allows Emily/Piper to leave with Claire and Dylan she makes all kinds of comments about how often she'll be visiting. I'd like to know where concerned aunt was when the baby was being neglected by her addict parents--why wasn't she making a big deal then about taking care of Piper? Whatever--I'm with Dylan and Claire on this one: the family that raises you is your family. If Emily wants to know about her DNA she can wait until she's 18. In the meantime, possessive "aunt" can just back off. Anyway, while all this is happening Sarah is at home, ticked off at Nick for his secretiveness and for taking on a case of this magnitude without telling her what was going on. She clearly doesn't like being kept out of the loop. She's also downing Devon's special "relaxing" tea like it's water. There's also some drama among the teens. Brett wants Andie--she just wants a friend. Andie wants Charlie enough to tell him she's not quite human; he can't deal with it and cuts Andie loose. Lexi wants Brett and was using Charlie to make Andie jealous. Does anyone really care? Maybe the producers thought teens and parents would sit down and watch the show together, so they covered all the bases and threw in a bit of something for everyone. It doesn't work. The episode ends with deputy Leigh driving out to the deserted countryside just outside the Gates and letting Christian go. Before she leaves she informs him he's not welcome back anytime soon. Christian seems pretty pleased about the situation--until he notices Claire coming out of the darkness. She's the one who arranged for his release and she makes sure she puts a stake right through his heart. And another bad guy gets what he had coming. Aside from certain pacing issues, this really was a decent episode. The acting (aside from Emily) is good, the story is interesting, and there are some great vampire moments (plenty of fang). Unfortunately I have a feeling that'll be the last of episodes like this. Appearance: Pale humans. Long, sharp fangs when the vampire emerges. Strengths: Super strength, speed. Heightened sense of smell. Weaknesses: stakes, sunlight, blood lust. Mythology: A stake straight through the heart will kill a vampire. Dylan: I should have done a proper job and finished him [Christian]. Dylan: [to Nick] Christian violated my wife. So I tried to kill him. Christian: Chief Monohan, my name is Christian. May I call you Nick? Dylan and Christian: The night is young and we have forever! The Gates, Season 1 Episode 10 "Little Girl Lost." Written by Robert Hewitt Wolfe. Directed by Steve Shill. From ABC. The Vampire Diaries S2 E12 "The Descent"
True Blood S3 E11 "Fresh Blood"
Moonlight S1 E13 "Fated to Pretend"